Barcelona — Governments can no longer hide from the devastating consequences of wild weather and rising seas, and must dig deeper into their pockets to curb and repair the damage, developing nations said ahead of a key U.N. climate change conference. Gebru Jember Endalew, chair of the Least Developed Countries (LDC) group at the talks, said international cooperation was "the only way to address the global threat of climate change". 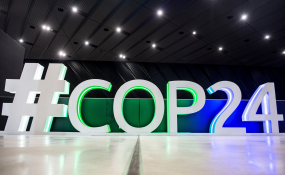 "Trillions of dollars in climate finance (are) needed to cover the costs of adapting to climate change impacts, coping with loss and damage, and pursuing clean development pathways to avoid emissions," he said in a statement before the meeting. As part of that, "clear rules" are needed on the provision of "adequate and predictable climate finance" to make intended steps to tackle climate change a reality, Endalew said. "The longer poor countries have to wait, the larger the cost will become," Endalew warned. The Organisation for Economic Co-operation and Development (OECD) said on Thursday climate finance provided by rich states to developing nations totalled $56.7 billion in 2017, up 17 percent from $48.5 billion in 2016. It did not give an update on how much private finance has been mobilised by governments toward the $100 billion goal. Joe Thwaites, a sustainable finance researcher with the World Resources Institute (WRI), said the 2017 OECD estimate had assuaged fears government funding might "fall off a cliff edge" after U.S. President Donald Trump took office and vowed to slam the brakes on international contributions. Recent U.N. and other reports have made it clear "there is no question we are dealing with serious (climate change) impacts, and there is a huge, huge need for adaptation finance", said WRI researcher Niranjali Amerasinghe. Even European countries - which have been keener to deliver climate finance - are reluctant to sign up to making future projections of their own funding commitments under the Paris "rulebook", said Jens Mattias Clausen, climate change advisor with Greenpeace Nordic. "This is essential to enabling developing countries to build the skills, institutions and systems that are fundamental to their developing and even thriving in the face of climate change," he said in a statement.